As our costs at the gas pump increase, we're feeling it at the grocery store too. 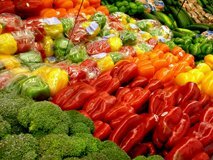 Frugal grocery shopping helps in the search to save money on grocery bills by adopting simple living into our lifestyles. Go back to basics and look at where you can cut. Get out last week's grocery receipt and look for all the extras such as chips, sodas, cookies that could be homemade, processed cereals (oatmeal in bulk is cheaper and better for you), processed snacks, etc. Look and remember if you bought duplicates of something because you couldn't see it in a disorganized pantry. At some point during this process you won't be able to cut anymore and will reach an average dollar amount for your grocery bill that you can budget on. Simple living is going back to basics and focusing on your family's needs. Simple living along with an organized pantry is the basis of frugal grocery shopping, and no it's not self denial. Quite the opposite, simple living allows us to continue to save money, eat good food, and build financial security ($$$ in a savings account). Organize your pantry so you know what is on hand. Shop the perimeter of the store (you'll eat healthier). Cut up your own veggies, wash and shred your own lettuce. Eat whole, not processed foods. Grow your own produce in a garden. Shop farmer's markets (you may get a discount if you go towards closing since vendors don't want to take the stuff home). Make Kool-Aid or sun tea instead of buying sodas… better yet, drink water. Frequent the canned food outlet in your area and stock up when they have good stuff on sale. I buy canned beans by the case from these stores. Cook in bulk and freeze. I'll cook pasta sauce for dinner in a double batch and freeze half for later. Buy in bulk when you see a great sale and freeze. Nothing goes to waste. For instance, bad bananas are frozen to make bread, left over mashed potatoes become potato pancakes, etc. Eat leftovers by creating fun new meals. Left over tri tip roast can be diced and added to refried beans the next night for burritos. Go meatless... rice and beans, soup and bread. Speaking of soup, ham bone from Easter makes split pea soup for two to four meals and a couple of nice meals of red beans and rice. Eat out of your pantry. There are plenty of meals ready to be made in there. Keep items in your pantry and freezer that can be put together for a quick meal. For example, I keep clams and linguine on hand for a quick meal and bacon for quick BLT's. I use the cookbook Desperation Dinners when I'm desperate to get a meal on the table. They have what is called the desperation pantry with recommendations to stock your pantry with to make quick meals in twenty minutes or less. This is my go-to cookbook when I'm short on time and my family is starving. Photo courtesy of Margan Zajdowicz may not be copied, reproduced, or sold. Cut eating out, I was amazed when I first started tracking our expenses at the amount of money we spent eating out when I worked outside the home. I had no idea we were spending that kind of money when we could have been eating at home saving money. These are some quick ideas to help with your frugal grocery shopping. Just follow these simple ideas and you're on your way to cutting your grocery bill. 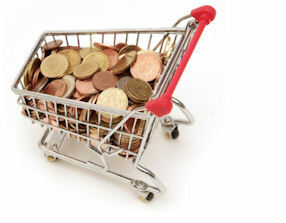 For more great tips on frugal grocery shopping, see the page Grocery Shopping on a Budget.